In the past week I went on two patrols of the Sound with local fishermen and Sound enthusiasts. Getting out on the water with local boaters is the best way to explore the many local treasures along our coastline and to learn about community concerns, challenges and opportunities. Last week I toured Huntington Bay with local clean water advocate Ken Burr. 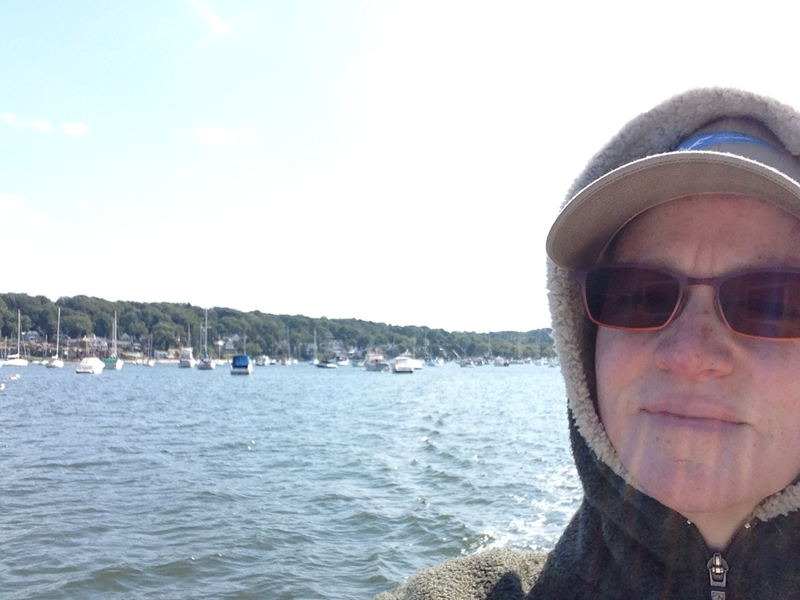 We met in Northport Harbor and spent three hours touring this beautiful stretch of the North Shore. We visited Centerport Harbor, Duck Island Harbor, Huntington Harbor, and Lloyd Harbor where Ken grew up. The wind was blowing but that didn’t keep the fishermen away. Huntington Harbor was full of working boats. Not surprisingly, the beautiful beaches were mostly empty but we did see one hardy soul in the water at Centerpoint Beach Park. After we returned to land Ken gave me a tour of the Crab Meadows watershed which includes multiple nature preserves and a golf course that drain into the Sound in between Crab Meadows Beach and Geisslers Beach. Ken and his neighbors are working to preserve this important saltwater marsh that is home to many fish and rare bird species. I plan to return soon with my kayak to explore the tributaries in this watershed. 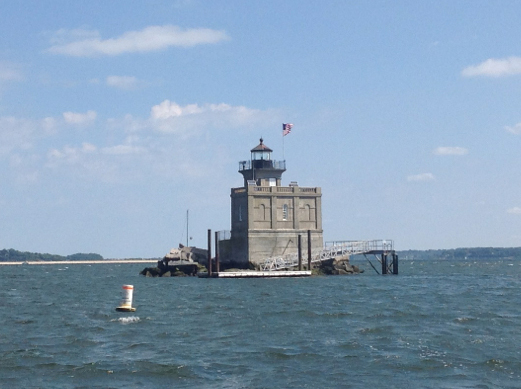 Also last week I returned to Eastchester Bay and the Hutchinson River with Captain Peter Sattler. 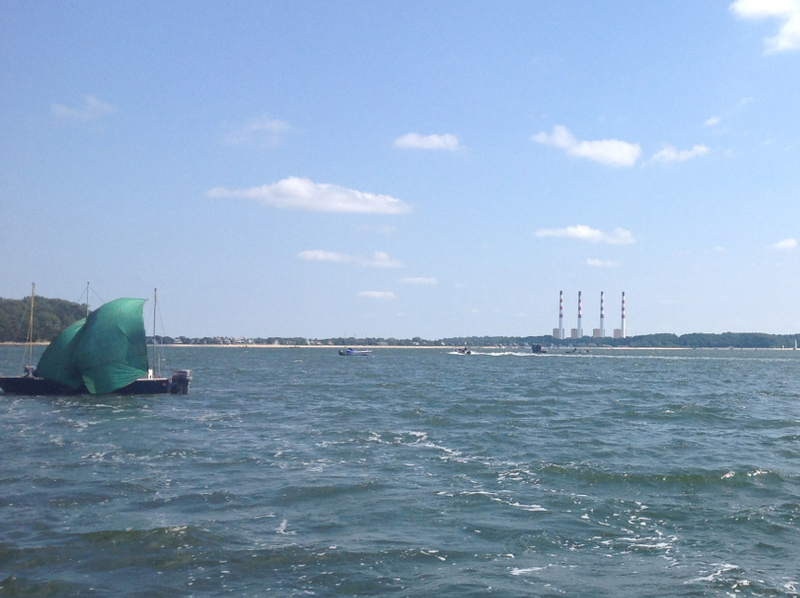 We sailed out of Evers Marina in the Bronx and traveled up river to just north of the Route 1 Bridge. It was a beautiful clear day and we collected water quality samples along the route. The mouth of the Hutchinson is a study in contrasts. 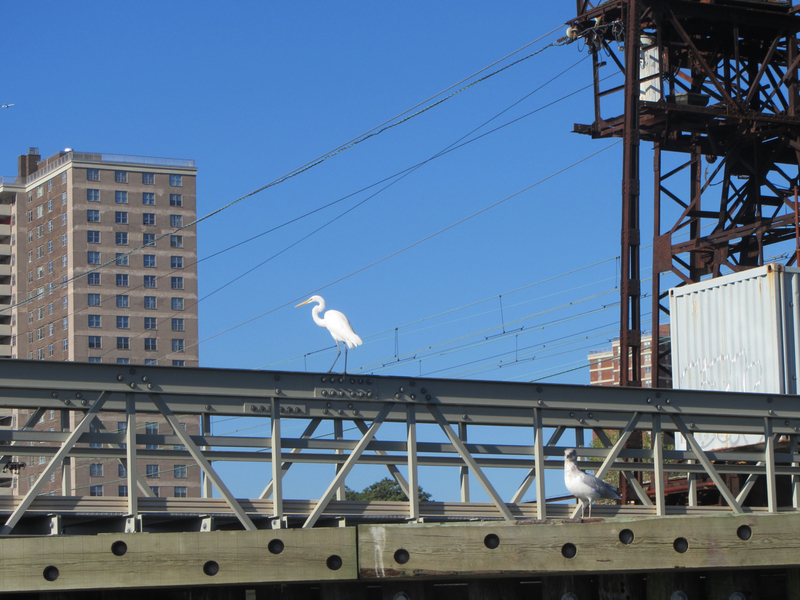 The eastern shoreline provides a bucolic scene of birds nesting along Pelham Bay Park, while the western shoreline is lined with industrial properties and tall chain-link fences. As we passed Co-Op City on the west, I remembered the public meeting I recently attended there to comment on New York City’s combined sewage overflows (CSOs) into this waterway. Two residents from Co-Op City made impassioned pleas for public access to the waterfront for their community. Knowing the tremendous quality of life benefits that waterfronts provide, I shared contact information with the residents and will follow up on behalf of Save the Sound to support their quest for access to the Hutchinson River. Back on land I visited the narrow upstream stretches of the Hutchinson in Pelham and Mount Vernon. Returning to the active sewage overflows we are tracking in these communities, I collected more water quality samples, shots video and took photos. 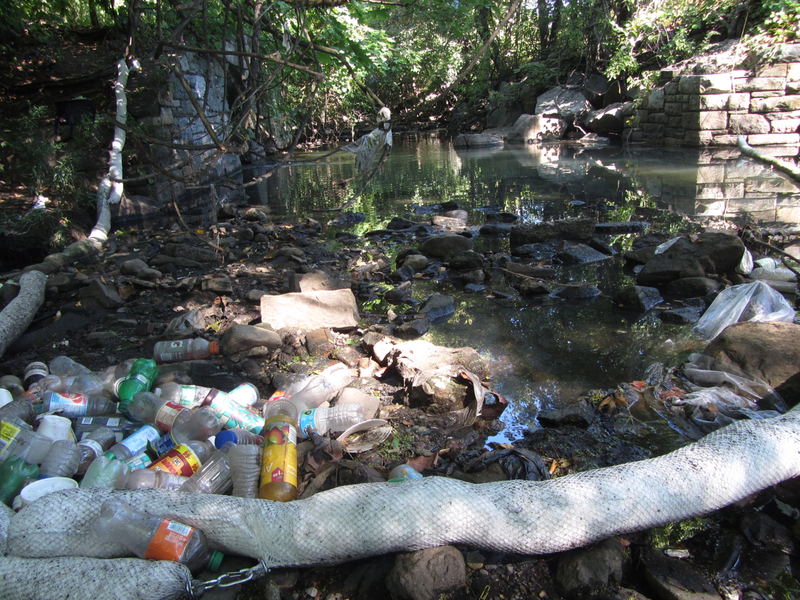 This gunderboom full of trash is downstream of the active sewage overflow in Mount Vernon. 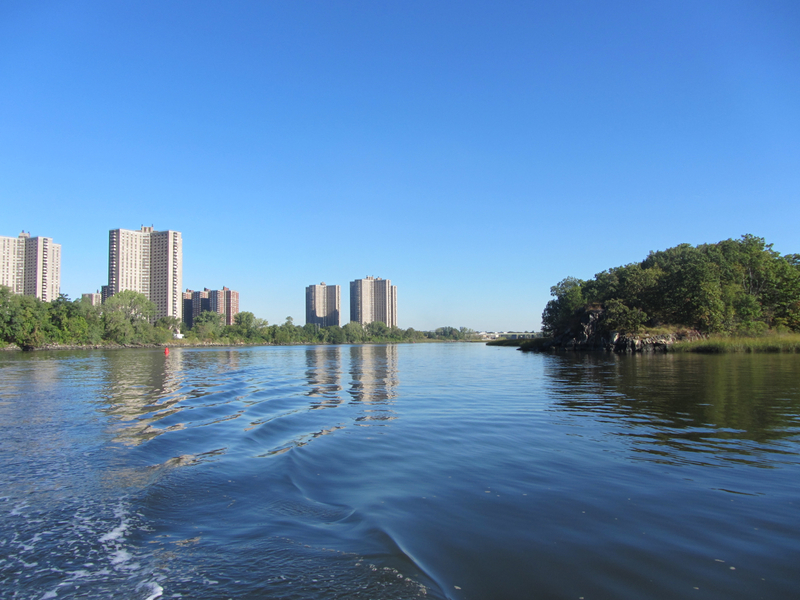 Preliminary lab results show continued elevated and unsafe levels of sewage pollution at the upriver locations in Westchester, as well as some sites we sampled from the boat. We will continue to patrol and test these locations until improvements are made. Check back soon for more sampling data from the Hutchinson River and elsewhere. A heartfelt thank you to Peter Sattler and Ken Burr for generously sharing their time and local knowledge with me, and for being champions of a healthy Sound!